Best pan for roasting potatoes | The top 3 tested, reviewed and rated! 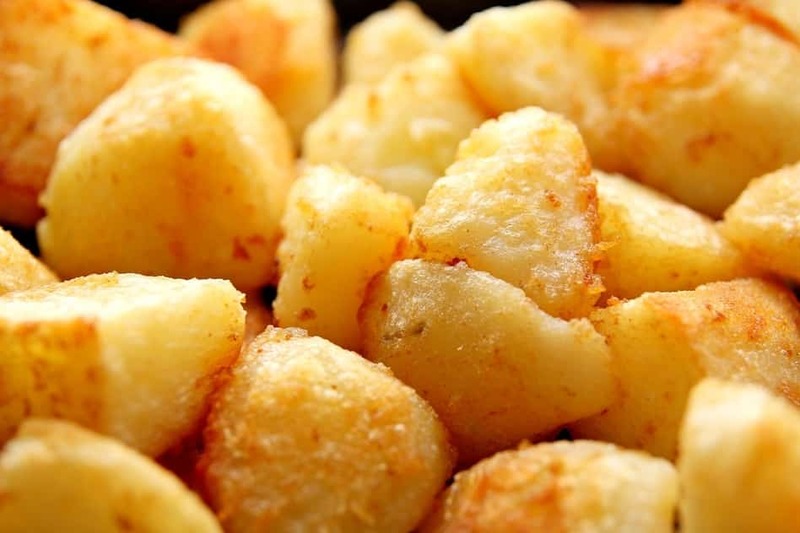 Roasted potatoes are one of the world’s best starchy treats. A staple for any roast dinner, Christmas feast or any time you have roasting-friendly spuds on hand. Roasted potatoes require a pan to be roasted in…and a good one. You can pop them onto a baking sheet or tray, sure, but it’s just not as good as a deep-sided roasting dish. You want to be able to have enough room to get a good toss and turn mid-way through the cook-time. Plus, it allows you to cook your meat and spuds in the same pan at the same time, letting those meat juices further flavor the potatoes. But no more chat, let’s get into the best pans for roasting potatoes! 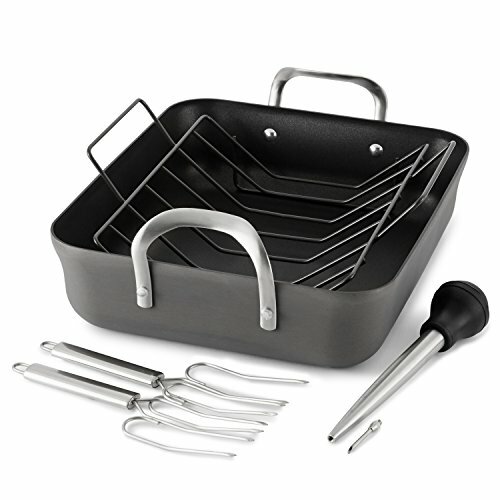 This beauty from renowned brand Cuisinart is made from shiny stainless steel, with an aluminum core. The aluminum core is there to help the heat to absorb quickly and evenly. Stainless steel alone isn’t the best heat conductor but matched with aluminum it’s a wonderful duo. We love the deep sides of this pan, you can fill it with loads of roasted potatoes while still giving the spuds plenty of room to become crispy (it has a 16-inch cooking surface). 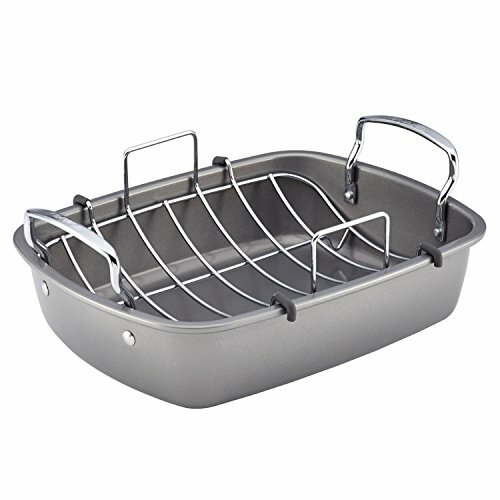 The stainless steel rack is very handy for using the pan for roasts. It lifts the meat off the surface of the pan to allow heat to flow around all sides of the meat. Another cool feature is the Heat Surround Technology which makes sure the base and sides of the pan are heated evenly and thoroughly. This is great as it means your roasted potatoes will get an even coating of golden crispiness, with no pale or underdone spuds. The handles have been very well thought out, with plenty of room for getting a full-hand grip on each one when lifting in and out of the oven. Plus, they stay cool when the pan is on the stove (i.e. for making gravy) thanks to the Cool Grip design. We think this is a great pan to invest in as the materials, construction and design features are all super high quality. You’ll get a lot of use out of this and it will last a very long time with proper care. You also get a lifetime warranty with this pan, which is always a welcome feature. 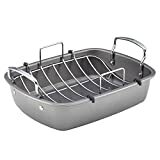 It’s a versatile pan, handy for roasting potatoes, creating full roast meals complete with meat and veggies, and anything else which requires an oven-safe, large and sturdy pan. It’s dishwasher safe (though we recommend hand washing) and induction compatible. And yes, it’s very aesthetically pleasing too! This good-looking pan comes to us from Calphalon and is made from their signature hard-anodized aluminum for great heat distribution. It’s a lovely design, in deep charcoal-black with high sides and a square-ish shape. 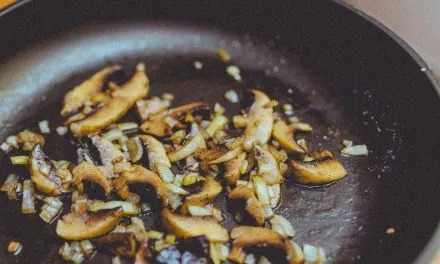 This pan has 3 layers of PFOA-free non-stick coating which we really love. 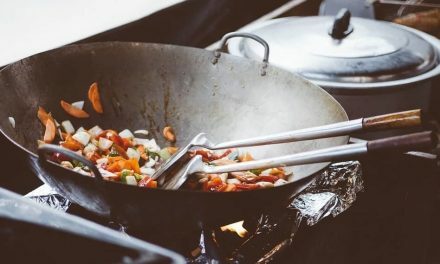 This makes it easier to cook with less oil and makes clean up much easier without stuck-on pieces of potato and grease to contend with. This does mean you can’t use metal utensils, but that’s not a problem considering your potatoes will be free and easy to move with a rubber spatula or rubber-coated tongs. The sides are nice and high so you can pile up your spuds and turn them easily without flicking or spitting oils over the sides. It comes with a removable rack which comes in handy for Sunday roasts. Just pop the potatoes into the pan, place the rack on top and set the meat onto the rack. It also comes with two stainless steel lifting forks (for stabbing and lifting that meat roast! ), and an injection baster. We love the value provided by these extras. There are two handles made from brushed stainless steel, with plenty of hand room and a very secure attachment to the pan. This is crucial when lifting heavy, hot pans full of roasted potatoes in and out of the oven safely. The cooking surface is 16-inches (the same as the Cuisinart pan above) which is ample for a large batch of roasted potatoes. You can use this pan on the stovetop and in the oven (of course) up to 450 degrees. It is dishwasher safe, but we recommend hand washing to preserve the quality. 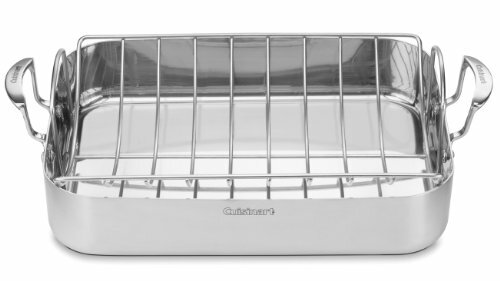 The non-stick surface will make hand washing so easy you won’t have to turn to the dishwasher anyway! It’s attractive. It’s sturdy. It’s truly non-stick. It’s secure to carry. It’s a fantastic choice if you’re a regular roasted potato maker and you want a few extra items for your money. Last but not least, we have a roasting pan from Circulon. This attractive pan is made from carbon steel, which is very hard-wearing, reasonably non-stick and distributes heat amazingly well. This is fantastic for roasted potatoes, as we want an even result with golden crispiness all around with no “cold spots” around the pan. 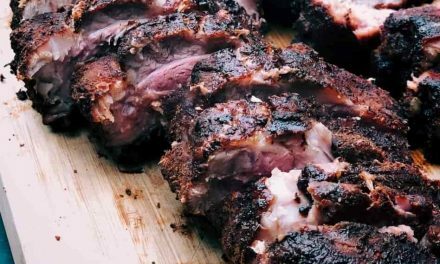 Like the other two pans, it comes with a roasting rack which suspends meat above the roasting surface for even heat circulation. The size of this pan is more than large enough to fit a huge batch of roasted potatoes for the whole family (with leftovers), plus a large chicken or turkey on top. This highly-rated pan has those ever-crucial sturdy handles, large enough for gripping with the entire hand for sturdy transporting between oven and counter. 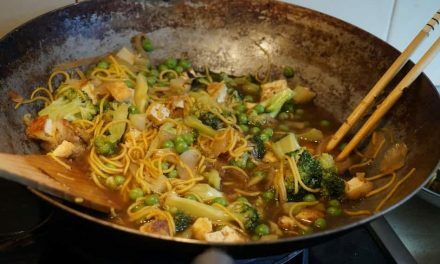 What’s more, it’s non-stick (PFOA-free, of course!) which makes hand-washing easy, (this is recommended, no dishwasher allowed!). This is a great option for people who prefer to use less fat when roasting potatoes, as the spuds can move freely without getting stuck to the surface of the pan. Circulon offers a lifetime warranty, always appreciated! There we have it! Three of the best pans for roasting potatoes. All three of these pans offer deep sides which are great for roasting lots of large, chunky potatoes. Two of them are non-stick, ideal for low-fat cooking and very easy clean up. And one combines stainless steel with aluminum for shine and great heat distribution. All three of these pans come with a rack for roasting meats. This is important because it means your pan always has a rack which fits perfectly for when you need to cook that whole-family roast dinner.